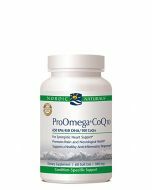 Nordic Natural ProOmega CoQ10 contains a blend of highly concentrated Omega-3 fatty acids and CoQ10 to support cardiovascular health. 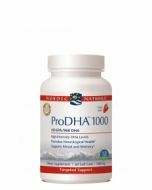 ProOmega CoQ10 supports overall heart health by supporting circulation‚ improving arterial elasticity‚ maintaining healthy triglyceride levels‚ and maintaining healthy heart rate and rhythm. EPA and DHA, the two main components of Omega-3 from fish oil, are essential for growth and development throughout the human life cycle. 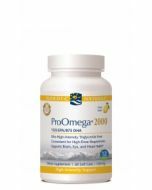 Nordic Naturals ProOmega contains 70% pure Omega-3, and is purified through molecular distillation to ensure the absence of impurities including PCBs and heavy metals. Every batch of Nordic Naturals fish oils is third-party tested for environmental toxins‚ including heavy metals‚ dioxins‚ and PCBs. 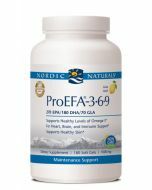 All fish oils used in Nordic Naturals products are in the triglyceride form and surpass the strictest international standards for purity and freshness. Purified deep sea fish oil (from anchovies and sardines)‚ soft gel capsule (gelatin‚ water‚ glycerin‚ natural lemon flavor)‚ borage oil‚ natural lemon flavor‚ d-alpha tocopherol‚ rosemary extract (a natural preservative).